The Tokyo Geographical Society was established in 1879, after the Meiji Restoration, as one of the pioneering modern societies of the sciences. Following the establishment of the European Royal Geographical Societies, successive presidents of the society were appointed from among members of Japan's imperial family. Since the 1970s, presidents have been elected from among member scientists. The Journal of Geography (Chigaku Zasshi) was first published in 1889. Its main editorial scope was geography, which included human science. With advances in the natural and human sciences, particularly after the establishment of plate tectonics in Earth science in the 1960s, geology and geophysics were also included. Our society has been flexible to change over time in adopting disciplines required to clarify phenomena related to the Earth. 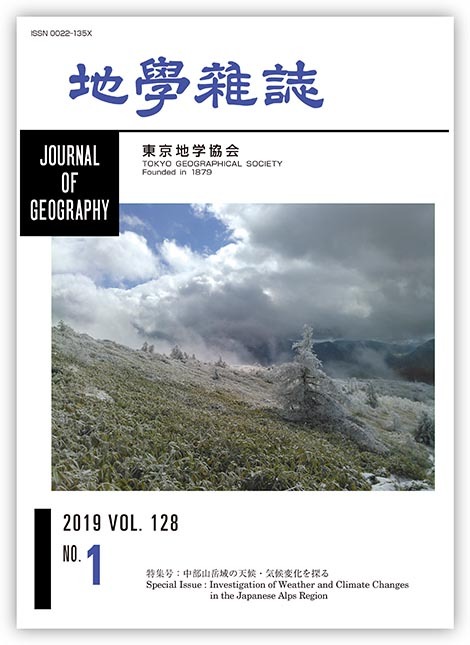 Recently, environmental sciences, which include urban disasters, civilization, infrastructure, eco-system, and saving energy, have been covered in the journal. More recently, with the inclusion of biospheric subjects, we have been offering extensive coverage of sciences that describe phenomena related to the Earth. Our journal presents subjects that not only bring together natural and human sciences, but also focuses on the history of the Earth and life both today and in the future. However, the central core of the journal is always based on solid Earth, environmental, and human sciences.